The beautifully tended squatted community garden in Sipson, Heathrow has been served a court summons for eviction. On the 1st of March this year the neglected plot on the planned site of the third runway was reclaimed, and for the last six months the Transition Heathrow team have worked with residents to rejuvenate, nay transform, the former market garden. They have shifted over 30 tonnes of rubbish from the site and set it to growing seasonal food, hosting workshops, teaching permaculture skills and even laying on a banquet for eighty people! 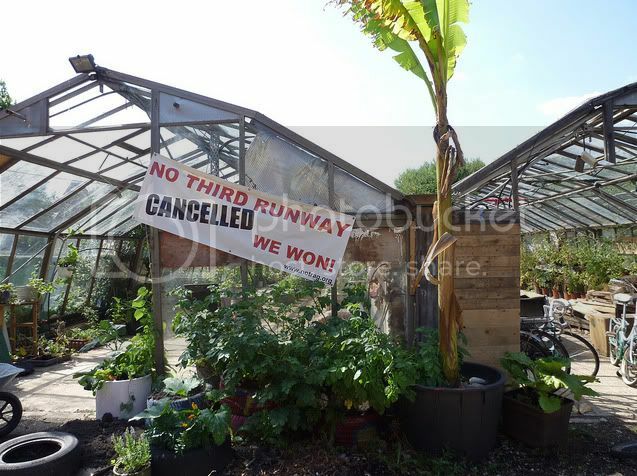 This ‘Grow Heathrow‘ project is part of a budding land movement in the UK linking communities who are taking back control of our food production, as well, of course, as supporting the successful No Third Runway campaign. Their work in building resilience into the community is a great example of developing alternatives to the dominant system which is hurling us all towards environmental (and economic) catastrophe.